There are 1,971 items available. Please enter a number less than or equal to 1,971. Works very well as designed! Considering buying another one or two. So happy I'm bouncing around in my underwear singing with glee! As described , Great price. Darn thing wouldn't work with my dead battery. Asked a question never got an answer. Delivery was 6 days past estimate. It didn't work. I still have to jump-start my lawnmower! Listing indicated a 5 limit. Only could purchase 1. Seller sorry for confusion. Item was never delivered. Seller did not want to resend item. Refunded money. I'm not sure what the "Jr" designation means, except that this is cheaper than the "Sr" version and works fine for my Kubota tractor, Toyota Corolla and WalMart riding mower batteries. I had slightly larger versions of this very item but all three faltered and died after about 5-6 years. I don't know why. This “Jr” replacement is lighter and hopefully will last longer. For the $20 or so cost per unit, they've saved me a LOT in battery life. Example: My riding mower's battery is stamped "2010" and I never used to get more than 2-3 years out of that class of battery. In that regard, a retired Navy neighbor informs me that he worked on ships where some lead-acid batteries, because they were properly "tended," lasted over 30 years. 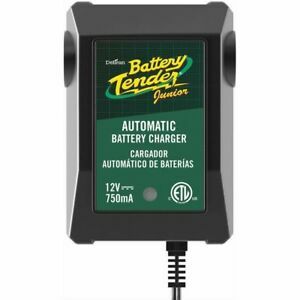 What I like the most about this brand is that it both recharges AND maintains (“tenders to”) the battery, keeping it at a steady, topped-off level, ready to go even if I haven't used the vehicle in over a month or two at a time. It’s easy to use and has never given me any problems – except when it dies (maybe this replacement model will last ten years or longer). I now have two of these but have been hesitant to trust the float mode and usually only plug in for a couple hours the night before I intend to run my bike. That being said, they do not seem to boil the battery as you can hear while closely listening to other tenders of different brands. I love the led light feature as I can turn on the bike's headlights etc. to drop the voltage and cycle the battery without actually moving or even starting the bike. I got exactly what is in the photo and as described. I have installed it on my lawn tractor. So far it is working great as expected. I have 2 of the automotive one and they have been great for over 10 years. I expect the same of this one. We have one of these on our company lawn tractor and it has been working great since I installed it over 2 years ago. Also easy to install. I only recommend you put some type of reminder so you don’t drive away with it and lose it. Great for keeping ATV battery charged in off season. This purchase completed my need for a Battery Tender. Our family has 3 ATV's and I use the battery tenders to keep those batteries charged while in the off season. I had a bigger unit (1.25 miliamp) last year for one of the ATV's but I now use that one for my new John Deere riding lawn mower. These work very well and I haven't had any negative issues with them, or any Deltran product. I have 7 total, 4 big size and 3 smaller. This battery charger is a quality product. It has Long cords, bright indicator light and easy to use. I have used battery tenders in he past and hey perform well.